Desperate for a lead on Savage, Rip responds to a distress call from another Time Master, in the hopes of using their computer to update Gideon with the latest chronological data. Unfortunately, the distress signal turns out to be the ruse of some very clever space pirates. Now, with half the team held hostage and Rory turned traitor, it will fall to Professor Stein to save them. Meanwhile, back on The Waverider, Sara and Snart become trapped in the cargo bay and Ray and Kendra will have to act quickly to save them before the life-support fails. Star Trek (the plot of the episode Space Seed, the training test Rip and Miranda go through resembles the Kobayashi Maru and various tropes and references throughout), Star Wars (Jax says "I have a bad feeling about this." in reference to the movies, the Time Master code of conduct regarding romance is similar to that of the Jedi, various other references), the 1969 movie Marooned (the title, the subplot where Sara and Snart must be rescued before the life support fails mirrors the plot of the movie), the novel Of Mice and Men by John Steinbeck (Snart's solution for dealing with Rory) and various pirate story tropes. Snart's story about how he and Mick Rory first met in a juvenile detention center contradicts a story from The Flash: Season Zero which depicted the two meeting for the first time as adults. Gideon addresses Ray as Mr. Palmer rather than Dr. Palmer, when Sara asks if he is okay. When did Snart get a chance to recharge his cold gun between the time he and Sara escape and the time Rory leads the pirates onto The Waverider? Sara and Ray seem to be fighting pretty well for two people who had just suffered severe hypothermia. This whole episode is Arthur Darvill's time to shine. From the opening scene in which Darvill does some wonderful silent acting watching the hologram of Rip Hunter's dead family, through the flashbacks where Captain Hunter is torn between love and duty to the final scene where you see the hope fill his face as Captain Baxter agrees to help him, Darvill is outstanding throughout. While the episode cheats on his action sequences, there's something infectious about the joy Victor Garber conveys as Professor Stein plays space hero that you can't help but smile at. The interplay between Sara and Snart as they are freezing to death is another nice moment between Caity Lotz and Wentworth Miller. While the episode as a whole may be Arthur Darvill's showcase, the last two minutes are all Wentworth Miller's alone. The CGI for the ships are grand stuff for a Network TV budget. The transitions between the present and Rip's flashbacks are brilliantly edited. The fight choreography during the fight between the Legends and the pirates is good. What makes the whole sequence great, however, is the editing which links all the various fights together in one fluid gesture, as the slamming of one body signals the cut to a similar move elsewhere. Structurally as well as thematically, this episode is full of nods to Star Trek. The distress call masking a trap plot was used more than a few times. Ditto the device of one of the crew mutinying and joining with the villain of the week. Rip refers to the group going to the Acheron as a boarding party. The actual plot of the episode closely resembles that of the episode Space Seed. That episode also centered around the heroes responding to a distress signal and a member of the Enterprise crew betraying her allies to join the forces trying to take over the ship. Professor Stein makes reference to being a fan of a comic called Rick Starr: Space Ranger when he was ten. While there was never a Rick Starr: Space Ranger title, Rick Starr was the secret identity of a DC Comics sci-fi hero who was known as Space Ranger. First appearing in Showcase, he later became a feature character in the sci-fi anthology comic Tales Of The Unexpected and later appeared in Mystery in Space. The training simulation we see a young Rip Hunter and Miranda Coburn run through in Rip's first flashback bears a slight resemblance to the Kobayashi Maru - a test given to officers at Star Fleet academy in Star Trek. The test places officers in a no-win situation and is meant to be a test of character. One candidate- James Kirk - became the only person to pass the test by hacking the computer so it was no longer impossible to win. He was praised for his original thinking, much as Miranda was, though it doesn't appear the Time Master test was meant to be an no-win situation. Jax quotes a frequently repeated line from the Star Wars movies - "I've got a bad feeling about this." The leader of the Time Pirates is named Captain Jon Valor. In the classic DC Comics, Captain Jon Valor was the name of a historical hero known as Black Mask. He was a privateer, who sailed under the command of The King of England and fought pirates. He was later revived as a ghost pirate in the 1990's Starman series, where he was known as The Black Pirate and the resolution of his death curse was a major plot-point of the series. Ray quotes the "Stardate" line used to begin Captain's Log entries on Star Trek. Ray and Kendra name-drop the characters of Captain Kirk, Captain Picard and Lieutenant Sulu from Star Trek. Ray also mentions Han Solo from Star Wars. Rip Hunter makes mention of The Imperiex Onslaught. In the comics, Imperiex was the embodiment of entropy and the main villain of the Superman: Our Worlds At War storyline. Rip Hunter also mentions Kanjar Ro, claiming that "Captain Palmer" once out-ran him. In the comics, Kanjar Ro was an alien tyrant and all-around bad guy, who frequently fought The Justice League and The Green Lantern Corps. The Time Master's code forbidding personal attachments is similar to the Jedi code prohibiting love from the Star Wars movies. The sequences in which Sara and Snart cope with the cold of the hold and the scenes in which Ray begins to suffer the effects of oxygen deprivation mirror similar scenes from the 1969 movie Marooned, which dealt with a team of astronauts stranded in orbit on a dead ship. More than likely the episode title is a nod to the film as well. Gideon tells Kendra that the odds of Ray having survived as long as he did in the cold of space without air are 3720 to 1 against. These are the same odds C3P-O quotes to Han Solo regarding how likely it is to navigate an asteroid field in The Empire Strikes Back. Rip's exchange with Captain Baxter about the importance of love feels like the sort of thing Captain Kirk would have said at the end of a classic episode of Star Trek. The ending with Snart and Rory echos the ending of Of Mice and Men, where the quick-witted George kills his slow-witted friend Lenny who has become a real danger and moved beyond his ability to manage. When a Time Master ship returns to Vanishing Point, its CPU is updated from the temporal database. In short, the software is updated. The Waverider is capable of traveling in outer space as well as through time. A self-destruct code is used to disable the Acheron's temporal navigation system. Ray did not design the ATOM suit to function in space. It proves capable of protecting him, though the oxygen supply is not enough for him to function for very long without becoming light-headed. Hunter: I vowed to save my family, but I'm failing them. (sighs) Perhaps I'm not the Time Master they need. Stein: You must be. You're the only one they have. Rory: I'm sore because I was recruited for my unique ability to light things on fire. !Now, I'm locked in the one place where I can't light things on fire - a spaceship! Rory: The sooner we end Savage, the sooner I get back to where I belong. Rory: Any prison on Earth's better than this one, Professor. Jax: To quote every Star Wars ever made, "I've got a bad feeling about this." Hunter: You don't know my crew. They're iron-willed and battle-hardened. The most formidable warriors to navigate time and space. Kendra: I hate to break it to you, but you're no Captain Kirk. You're Picard. Ray: But Picard was cautious... pontificating... sort of sexless. Kendra: Tell that to Vash! And for the record, Picard was way hotter than Kirk. Snart: Ugh. Mick had it wrong. This ship isn't a prison. It's a torture chamber. Sara: I suppose this feels like a day at the beach for you? Snart: If I had to pick a way to die, freezing wouldn't be the worst. (pauses) What's it like? Dying? I imagine you've got a unique perspective. Sara: You know, it's funny. I mean, you'd expect it to be terrifying? Just panic and fear? Snart; What did you feel? Sara: I guess... lonely? (thinking) Yeah... like everybody I loved was a million miles away. (pauses) I mean, I don't like you, but at least I'm not dying alone. Snart: Closest I ever came to dying was... uh...the day I met Mick. Sara: Why does that not surprise me? Snart: Nah, it wasn't like that. It was my first day in Juvie, I was 14, and the smallest kid in there by far. Some of the older kids wanted to make sure I knew it. So they jumped me. I fought back but one of them had a shiv. And I figured that was it. Until Mick stepped in. And they didn't mess with me after that. He's been standing up for me ever since. Sara: Let's just hope he's standing up for Rip and Jax now. Snart: Well, who else is going to take on those pirates? Stein: That'll teach you to mess with a nuclear physicist! Rory: I may have the IQ of meat, but I know how to cut a deal. Snart: Nothing quite like dying to make you think about all the mistakes, all the wrong choices. Sara: Is this Leonard Snart coming to God in his final moments? Snart: Hardly. Just... wishing I could take a few things back. (sighs) I should have left Mick in future Star City. Sara: Agreed. Hate to break it to you, but even if we make it out of here alive ... you're still going to have a problem on your hands. And I've seen enough to know that Mick is in a dark place. And he's not coming back. Baxter: You're one to talk about loyalty. Hunter: Oh, but I am, Captain Baxter. And not because I pledged an oath to serve as a Time Master. But a long time ago I made a far more important oath. When you call me a failure, Captain Baxter, you're right. Because I failed both my wife and my son. For betraying the Time Council, I have absolutely no regrets. But failing to save my family? That is something for which I'll never forgive myself. Sara: (To Ray) Are you okay? Gideon: Mr. Palmer nearly died. Snart: Welcome to the club! Snart: What are you doing, Mick? Rory: Getting us home. Are you in? Snart: Time to choose a side, I guess. Baxter: I still don't understand why you're doing all this. Hunter: Before all this started, I don't think I would have either. Baxter: We protect history. Safeguard time itself. There is no higher calling. Rory: I told you that'd be the last time you hit me! Rory: That the plan? Take me out in the middle of nowhere? Where no one can find the body? Snart: I wish there were some other way, Mick. But you're dangerous. A liability to the team. Rory: Team?! You and I were a team! What happened to you?! Rory: You think you're some kind of hero? But deep down you're still the same punk kid I saved in juvie! You haven't got the guts! You wanna kill me? Kill me! Only one of us is walking out of here alive. As the episode opens, Rip has been holed-up in his quarters for one week. 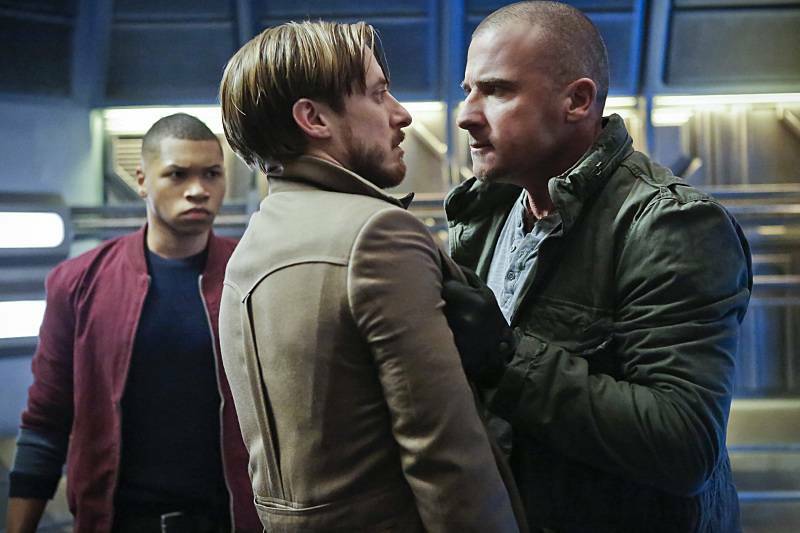 Snart refers to the events of 106 and his refusal to lave Rory in Star City 2046. The Acheron is the flagship of the Time Fleet. Her captain is Eve Baxter. Her AI is named Gilbert. Professor Stein dreamed of being an astronaut as a boy, but his poor eyesight made it impossible for him to get accepted at NASA. The ship AI of the simulation in Rip's flashback is Gary. Rip met his wife when they were both Lieutenants in the Time Masters. Their relationship was discovered, but Rip was allowed to stay after his wife took full responsibility for the relationship and resigned her position. Time Master protocol requires all Time Masters to take on new names, so that their families, descendants and ancestors cannot be targeted by criminal time-travelers. The alias used by Rip's wife was Miranda Coburn. Rip Hunter is famous enough as a Time Master to be known by sight by the time pirates. Ray and Kendra are both Trekkies. Sara and Snart are not. Snart met Rory at a juvenile detention center. He was 14 and the smallest kid there. Ray is allergic to cats, dogs and almost any animal without scales. As a child, he had a Burmese python named Slinky. Ray does not have a favorite color or a favorite member of The Beatles. The data Gilbert gives Rip, suggests a 99.8% probability that Vandal Savage will be found in Harmony Falls, Oregon, USA in March of 1958. Ray and Kendra share their first kiss. Snart kills Rory at the end of the episode. Unknown Time, Unknown Place for the final fight between Snart and Rory. A solid episode that feels more like a science-fiction epic than a superhero show, but that's all too appropriate. It is not without its flaws but it gives Rip Hunter some much needed definition as a character. And the ending may be the single most powerful conclusion to any episode in the DCTVU to date.